Harrys Bingo has received good reviews from players across the internet, many of which say that Harrys Bingo is the only online bingo site that they now use! 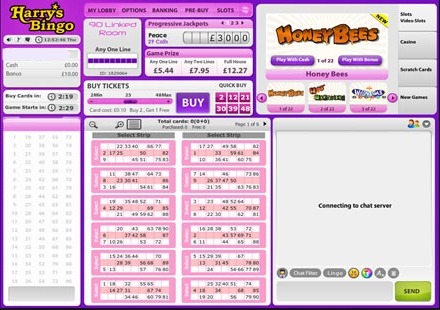 Harrys Bingo is owned and operated by Cozy Games Ltd and is powered by Cozy Games software. There is no download to play at Harry's Bingo you just have to create an account and you're good to go. Registration is easy and takes just a minute, select an alias, password and provide a few personal and contact details and you're done. Funding options at Harry's Bingo include Visa Electron, Solo, Switch and Visa debit cards, Visa and Mastercard credit cards, Paysafecard, Moneybookers, My Citadel wallet, Click2Pay and Neteller. Harry's Bingo offers 75 ball, 80 ball and 90 ball bingo with cards starting at 5p. The bingo lobby lets you know when each game is due to start, card cost, prize and PJP as well as how many players are in each room. The bingo rooms have funky theme names of 90 Dosh Lounge, 80 Bistro and 75 Zippy room. There are also loads of slots if you like a bit of variety, there are over 30 games. The bingo room is purple with multi coloured card all game info like card price, number of players in the room, prize total and PJP are clear to see. The bingo calling was basic, the caller a little dull and it seemed like the numbers were called in slow motion, that aside you could entertain yourself playing one of the side games of keno, roulette or slots. The chat room was busy and everyone I spoke to seemed very friendly especially the Chat Host who was very nice but a bit of a flirt. If you need help you can check out the FAQs, live help or open a support ticket. The CMs are pretty friendly and really know what they're talking about so you could always ask them if you get stuck. Harry's Bingo is laid out nicely and is very user friendly. The site itself is very community minded with a gallery of all the members and in each chat room, everyone seems to know one another. Harry's Bingo hasn't got the widest choice of bingo games around but offers good prizes and a great atmosphere as well as it's brilliant deposit bonuses and promotions. Harry's Bingo is definitely one of the better sites run by Cozy Games. No, you are not required to download this bingo game, there is an instant play version at Harrys Bingo . No, Harrys Bingo does not offer a downloadable version but you can play instantly on the site.